Everything's better when it's on a stick! Here's a cheap and easy tool you can make your self to spread Milky Spore powder over your lawn. Last fall when I was renovating my lawn I noticed some, but not a lot of grubs in some areas. Skunks were also digging up some areas to get at the grubs. They like to eat them. After my lawn started to grow back I purchased some St. Gabriel Organics Milky Spore Powder to spread over the lawn. They also sell a Dispenser tube for Milky Spore and a spreadable Milky Spore that can be applied with your seed spreader but I didn't get either of those and need to come up with something on my own. 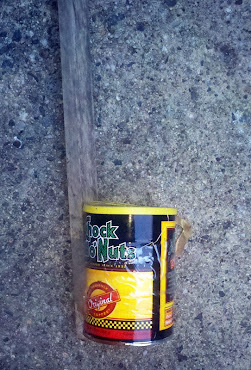 My solution was to poke some holes in the bottom of an old coffee can and tape it to a stick. Milky Spore Powder is a bacteria called Paenibacillus popilliae. This disease infects the white grub larvae of the Japanese beetle and kills them. As the grubs ingest the spores they get infected. The bacteria multiplies in them and when it eventually kills them more milky spore disease is spread throughout the lawn. A study showed that the bacteria can persist in the soil for many years. Here it was found that milky spore bacteria was still around and spreading 25 years after initial application. It is safe for humans, pets and wildlife as far as I've read. 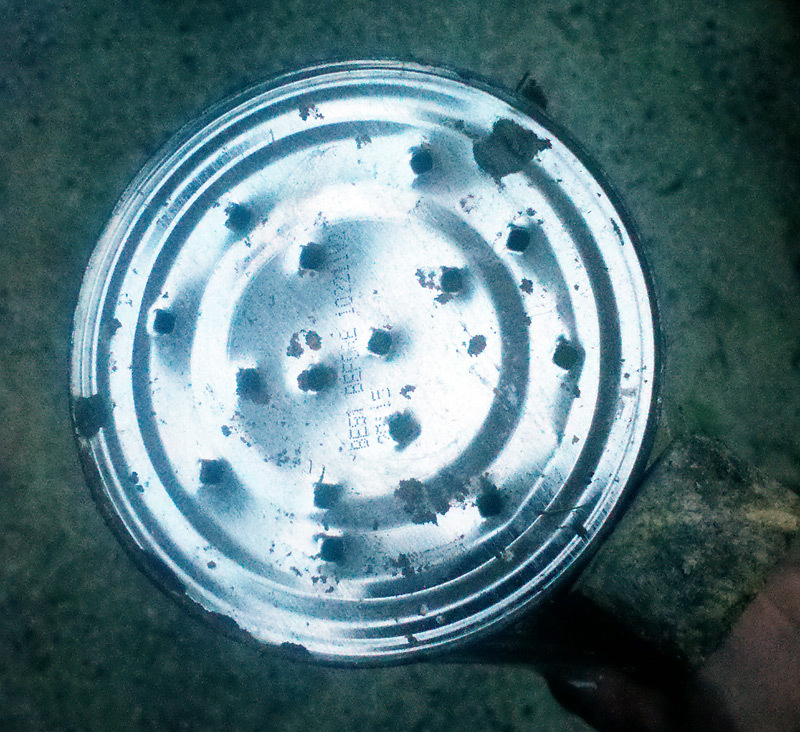 To make the milky spore dispenser, take an old coffee can, clean and dry it, then punch a few holes in the bottom of the can using a hammer and nail. Then tape it to the bottom of a stick. A 3-4' long stick depending on your height will eliminate any bending over while applying the powder. Diatomaceous earth has a similar texture and this may work well to dispense that as well. Next just fill up the can with the Milky Spore powder and start tapping or shaking it around your lawn. The instructions recommend applying 1 teaspoon of powder every 4 feet in a grid pattern. I like this method better because it more evenly disperses the powder across the lawn. If the grubs don't eat the spores they don't get sick and die. The better coverage you have the higher likelihood a grub will eat a spore. After application water it in to wash it off the grass and into the soil. The best time to apply milky spore is in the fall. In the summer the adult Japanese beetles lay their eggs in the soil. Around July-August the eggs begin to hatch and the grubs start feeding on grass roots near the surface. As the weather gets colder they migrate further down into the soil. As with all pesticides, make sure you read and follow the directions on the label. If there are no grubs in the lawn, there's no food for the skunks to dig for. It might take some time for the milky spore to make an impact in the grub population but there are some other things you can do to keep skunks from digging up your lawn. Skunks are nocturnal and they seem to want to avoid light. If you have an outdoor lamp near where the skunks enter your property keep the light on at night. You can use a low power consuming CFL or LED bulb to reduce your energy usage. If you don't have a light source where you see skunks, for example skunks love compost and I frequently see them hanging around my bin, put some solar powered path lights in those areas. A lot of solar powered garden lights are cheap and don't provide a lot of light. These Garden Creations Solar-Powered LED Accent Lights for example have mixed reviews but they're affordable and you get a lot of them. These Britta Products Ray-1W Solar Ray Garden Path Lights have better reviews and appear to be better constructed and provide more light though they do cost a bit more.